I really, really don't want to watch the video - so I won't. To those of you with a stronger stomach, I hope nazi carlson doesn't do the monologue with lust in his eyes. edit: to be clear I'm not homophobic at all, I'm tuckerphobic. Hard to "top" that, nor do I recommend trying. Truth be told, Tucker bottomed out long ago. Ah, Tucker is embracing his inner creep. Again. It's not 'sultry'...it's snarky BS...which is something Tucker 'believes' he excels at. He doesn't have the ballz to just come out and say 'He's gay and I'm supposed to be OFFENDED DAMMIT because I'm on FOX!' so he tries this crap. Lord. So, maybe "Butti-licious" isn't off the table for a campaign slogan after all . . . at least, it's not for Mr. Carlson? Honestly I don't think the guy's even political. What he is, to the core, is a nasty rich punk. Went to school with a bunch of them. I never did figure out what they were so sourly angry about. With Trump of Co. it was intense misogyny and racism. The homophobic assholes will be just as bad this time around. Maybe Tucker means it literally and his cannibal tendicies are finally surfacing. Seriously. It's an episode of Tucker In Love. I'll bet it gave Buttigieg the willies. Or hives. Wow, Can you imagine how Lindsey Graham feels, then? In Tucker's case, I suspect it was that he was a perpetual wedgie target at prep school. Eat who, and what, Tucker? Tucker seems to be a little too engaged and excited about Mayor Pete. 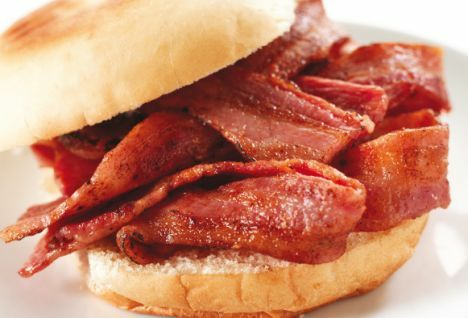 In the UK they have a popular breakfast sandwich called a “bacon buttie”. I regret that Tucker has Mommy issues, but there's no reason the rest of humanity, especially women though now a gay man, should have to abide his obvious emotional dysfunction. I never did figure out what they were so sourly angry about. Tucker has delusions of adequacy.